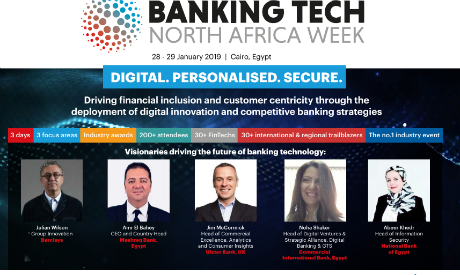 Egypt is set to host the Banking Technology North Africa Week conference on 28-29 January to demonstrate innovative and cost-effective digital banking services that aim to expand access to those currently unbanked while keeping increasingly demanding consumers. According to the event’s brochure, the two-day conference, which will be held in Cairo’s Nile Ritz Carlton, is set to feature keynotes by a number of influential speakers from the country’s banking sector. The first day will see a session titled ‘Inclusion, Digital Transformation & Payments Day,’ which will witness a number of speeches by the heads of leading banks in Egypt over the future of banks in the country and the road to a cashless society. ‘Data, Analytics, Cyber and Information Security Day’ will be the main topic on the second day of the conference, focusing on achieving business resilience and continuity through an effective risk management framework. The panels will also include discussions on preparing for new risks and ensuring security in the digital age and protecting consumers through fighting cybercrime and identity fraud to ensure customer trust and loyalty, among other topics. The Banking Tech North Africa Awards ceremony will be held on the end of the second day to recognise the most innovative and creative leaders that stand out from the crowd in the sector.